The pressure is always related to the absolute zero (absolute vacuum). A known absolute pressure indication is the ambient pressure. This is standard worldwide with 101325 Pa. All physical equations about pressure to work normally with absolute pressure data. This also applies to the formulas presented on these pages. Where a distinction is necessary, this is indicated by the labels "(rel)" done for relative pressure and "(abs)" for absolute pressure. Here, the pressure refers to the current ambient pressure. Relative to this, we speak of high pressure when the pressure is greater than the ambient pressure or negative pressure (or vacuum) when the pressure is less than the ambient pressure. This distinction is also made clear by a leading sign (eg -50kPa = vacuum). In APT systems you will find both. Thus, the test pressures are always expressed as relative pressures. The pressure regulator belonging are referred automatically to the ambient pressure to the required test pressure as the pressure difference. Also the pressure indicator is always relative to the ambient pressure. For some devices (particularly when combined devices for over-and under pressure) the test pressure is measured with absolute pressure sensors. 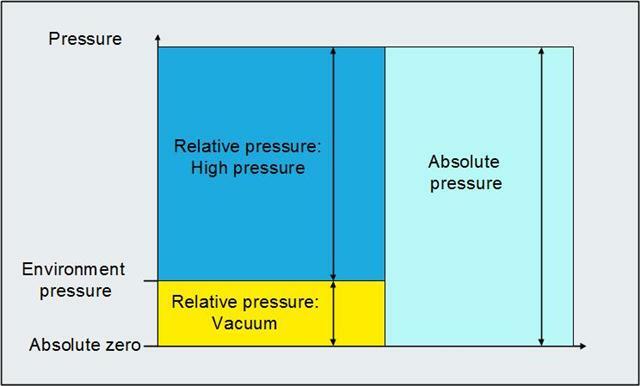 Here, the pressure is shown relative to the absolute vacuum. A known absolute pressure-measuring system is the barometer. It measures the currently prevailing ambient pressure relative to absolute zero (vacuum). At ambient pressure must also be noted that this may change due to weather conditions or the landscape (mountains, valleys) compared to the standard specification. The weather fluctuations can be calculated against by using only current measurements. When differences in height, the "Barometric height formula" must be used.